So…of course, milk and cookies…especially chocolate chip cookies. Peanut Butter and Jelly are right there too. For years, my family would fill my stocking with a bag of Dove Dark Chocolate bites and a bag of Orange Fruit Gels…you put them in your mouth at the same time…and…BLISS! Take a piece of already delicious and decadent dark chocolate and add a piece of tangy fruit (sorry apples…not sure you are quite cut out for this job) and BAM…you have just created magical chocolatey fruity alchemy. If you'd like to pin any of these recipes, please go to the original links shown below. Many Thanks! 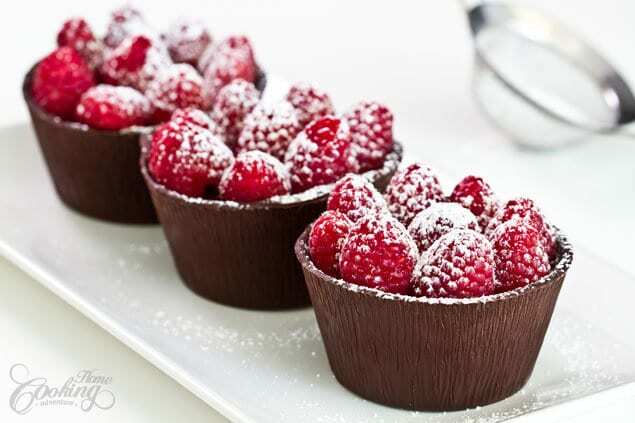 Ella at Home Cooking Adventure shows how to make chocolate cups which can be filled with just about anything, but will always be at their best (personal opinion) when filled with a fruit, say…oh, I don't know, maybe…raspberries! So, not much more explanation is needed for this dessert once you read the title of the recipe…Chocolate Dipped Strawberry Brownies! In terms of Fruit and Chocolate Desserts, Chocolate Dipped Strawberries may just be the grande dame of them all. Along the same lines, check out this beautiful dessert! And because there is no such thing as ‘too much of a good thing' when using ‘chocolate' and ‘strawberries' in the same sentence…this No Bake Strawberry Chocolate Tart is included for your consideration. Switching gears, tangy apricots and dark chocolate! In a lovely tart…and under that apricot you see peeking out is a layer of apricot filling! Be still my beating heart. Filed under ‘May Be Too Pretty To Eat…but then again…' is this absolutely beautiful and surely incredibly tasty Orange Apricot and Chocolate Tart. So, in other news, did I tell you that I have started a Meyer Lemon Farm? Well, in all honesty, my grove is currently about 1 inch tall…but they are getting there and when they do, I will need all sorts of recipes the incorporate the bounty of this delightful fruit that my grove will be producing…enter Meyer Lemon Filled Chocolates. Next, I'm going to start a Blood Orange Farm…then I can make MANY Blood Orange Chocolate Truffles. Until then, I can continue to use Cointreau and Chambord to flavor my truffles. And how easy is it to add some dried fruit, in this case candied orange peel, to a slab of chocolate to get that Fruit and Chocolate pairing! It's a rare day when I don't have a dark chocolate raspberry bar that I keep hidden in the kitchen, just for me. I can't tell you where I hide it because ‘they' may be reading this post and bad things could happen. Suffice it to say that the combination of Raspberry and Chocolate, may, and I don't want to hurt anyone's feelings, but just may be even better than Strawberries and Chocolate. Get a load of these chocolate treats filled with oozy raspberry filling! So, have I sufficiently demolished any willpower you might have been holding onto from the beginning of the year? Well, you know you always need to improve your fruit intake, right? And you know that a little bit of chocolate, the darker the better, is actually good for you! 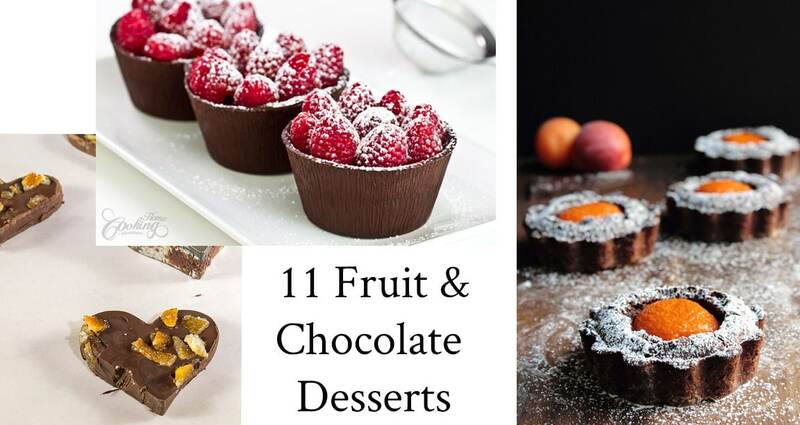 So, maybe I need to go back and re-title this post…'The Many Health Benefits of Fruit and Chocolate Desserts ‘…what do you think? Pin it for your future reference…or bookmark this page! Wishing you a fantastic weekend my friends and thanks for stopping by to visit. I appreciate you more than you’ll ever know. And when you leave a comment…ah, it makes my heart sing! Lynn, You’re making me hungry with these yummy photos of chocolate and fruit. Anything chocolate and strawberries or raspberries always wins me over. Wishing you a Happy Valentine’s Day, my friend! Congrats on your meyer lemon farm, it will be well worth the wait, we’ve had ours for about 10 or so years. They are one of the best fruits you can enjoy, just loved them in your dried fig meyer lemon (very fruit forward) recipe. Try that with brie. Oh so good. Just love it when you challenge us with your amazing recipes. Never know what’s coming next. Keep up the good work!